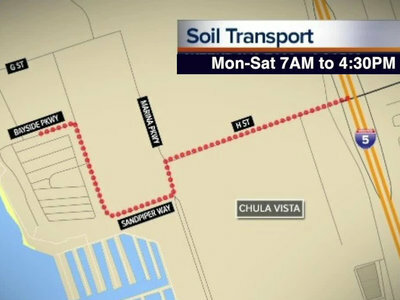 A soil transfer for Chula Vista's massive bayfront development will resume Monday, leading to some road issues. 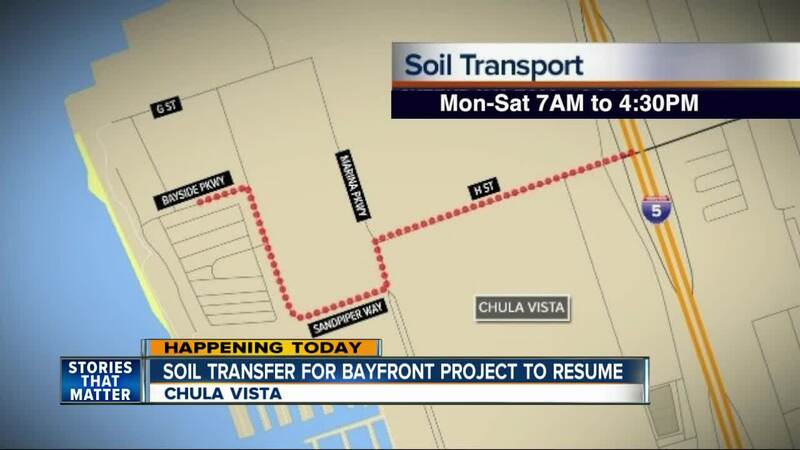 CHULA VISTA, Calif. (KGTV) - Starting Monday morning, motorists in Chula Vista will be sharing the road with trucks hauling soil for the planned bayfront development project. From 7 a.m. to 4:30 p.m., Monday through Saturday, trucks carrying soil will be making dozens of trips from H Street (at Interstate 5) to Sandpiper Way (from Marina Parkway), and on to Bayside Parkway. The soil transporting is expected to last until Aug. 11, with a second round of transporting to run from Aug. 20 into late October, Port of San Diego officials said. Officials said the soil transport is in preparation for the eventual construction of a 1,600-room resort hotel and convention center at the intersection of Sandpiper Way and Bayside Parkway. The bayfront project also includes a shopping district, expanded parks and space for the community. The project is expected to cost more than $1 billion and involves multiple phases of development. Officials with the Port of San Diego and city of Chula Vista approved a financial agreement in late April. The developer, RIDA Chula Vista, LLC, will invest $785 million into the project, while the city and Port will contribute a combined $300-plus million. Gaylord Hotels will operate the development. Construction could begin in late 2019. Port officials are also informing the public of construction already underway in an area southeast of H Street and Marina Parkway. The construction, which is scheduled to be finished by Aug. 8, involves equipment and trucks entering the bayfront from southbound I-5 via J Street to Marina Parkway. The equipment and trucks will exit the bayfront via Marina Parkway to H Street.